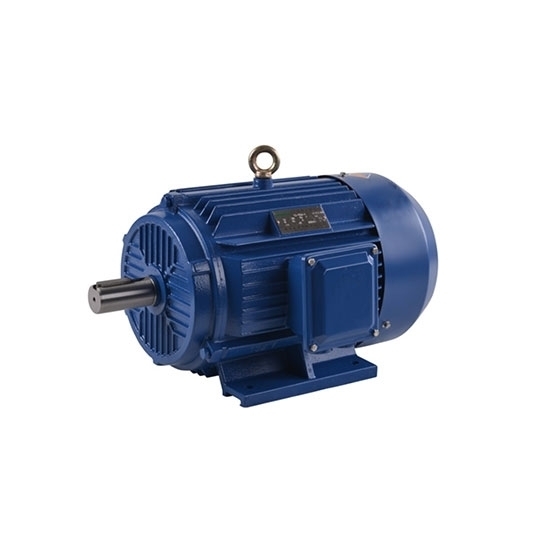 Induction motor or asynchronous motor, 2 hp or 1.5kW, 4-pole, 1400rpm, 3-phase, 380/400/415 Volts @ 50Hz, TEFC Enclouse, solid structure, attractive appearance, low noise, high protection class and durability. Low price and directly selling by manufacturer. 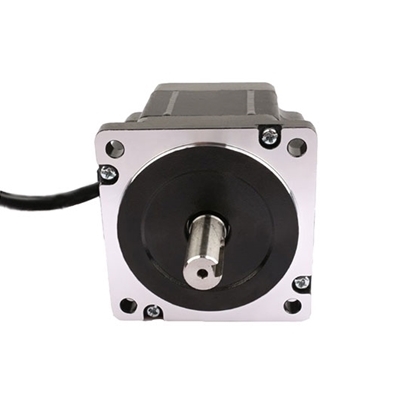 This is high quality Nema 34 3-phase Stepper motor with 1.2 deg. step angle, 1.3A phase current, and 7.6Nm holding torque. 100% brand new and manufacturer direct sale. 3-phase Nema 34 Stepper motor features 1.2 deg. step angle, 3A phase current, 7.6Nm holding torque. Connection is made through 6-wires. Favorable price and manufacturer direct sale. Three phase induction motor, with output 3 hp/2.2kW, rated speed 6P 940rpm, nominal torque 22.35Nm are high efficiency yet low cost. Optimum structure, high reliability, low noise, easy to install and simple to operate. Three phase induction motor is an AC motor with nominal power 7.5 hp/5.5kW, 2-pole number, squirrel-cage type, rated speed 2900rpm and TEFC enclosure. It is optimum structure, attractive appearance, low noise, simple operation, and high protection class. 2 hp (1.5kW) 3-phase 4-pole AC induction motor or asynchronous motor is characterized by rated speed 1400rpm, foot mounting, 90L frame size and it can widely used in various kinds of general purpose machineries like fans, pumps, compressors, machine tools, transportation and so on. Note: Our minimum order quantity for 400V AC and 415V AC @ 50Hz induction motor is 10 pcs, and our MOQ for 60Hz induction motor is 20pcs. The main structure of induction motor is composed of two parts stator and rotor where there is an air gap between them. In addition, there are end bells, bearings, motor frame and other components. Stator is a fixed part of asynchronous motor, consisting of motor frame, iron core and windings. Motor frame is the shell of motor, playing the role of supporting the motor, which is made of iron. Stator iron core is a hollow cylinder, stacked up with 0.5 mm thick silicon steel sheets. Stator windings are wound with insulated copper wires and embedded in the stator slot, which are separated by insulating material between the windings and the slot. The air gap of asynchronous motor is much smaller than the direct current motor with the same capacity, 0.2 ~ 1.0mm on average for medium and small asynchronous motor. 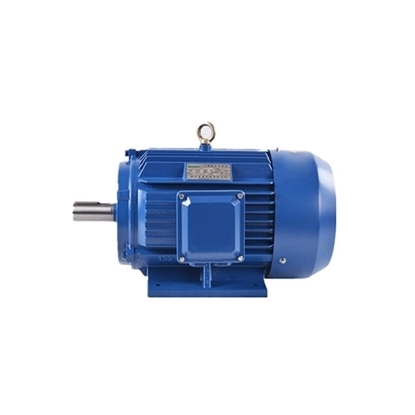 Motor rotor is composed of iron core, windings and revolving shaft. Rotor core is also a part of the magnetic circuit, generally stacked by silicon steels and fixed on the revolving shaft. Wound-type rotor winding can be connected into star or delta. In general, the small capacity rotor is connected into triangle; the large and medium capacity one is connected into star. The winding structure of squirrel-cage rotor is quite different from the one of stator. There are slots on the rotor iron core with a bar on each slot. Two ends of iron core that connect all the bars to the external of slots respectively form a short circuit. If the iron core is removed from the stator, the windings shape is like a squirrel cage. Some bars are made of copper, and some are aluminum. In this video, ATO takes a 1hp (0.75kW) 220V/380V induction motor as example to explain the motor wiring. 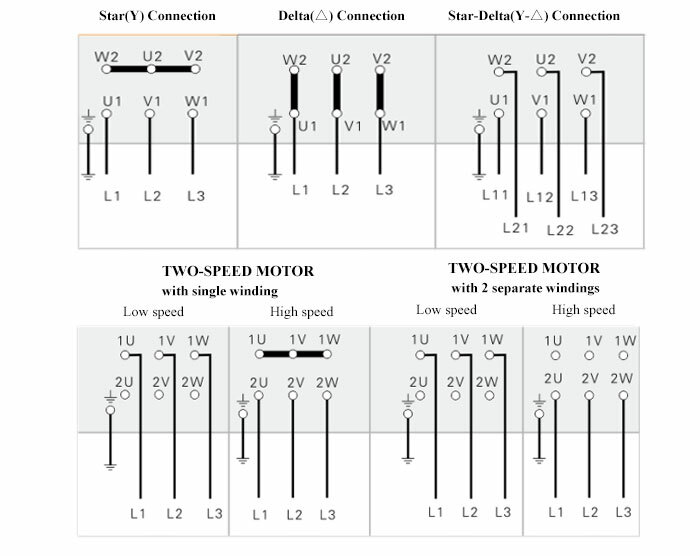 ATO first changes the wiring of induction motor from star connection to delta connection. 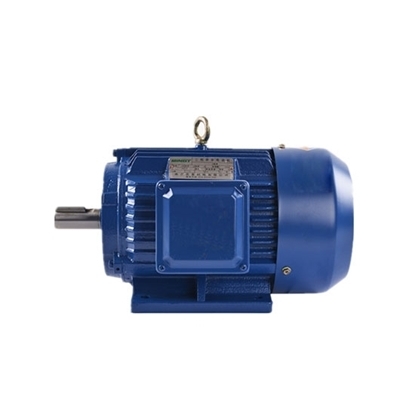 When the induction motor is connected in delta connection, the rated voltage of motor is 220V, and when connected in star connection, the rated voltage is 380V. To demonstrate this change clearly, the induction motor is also connected to ATO 1-phase in 3-phase out VFD and it runs normally under the control of VFD. Fast shipping and solidly packaged. Fast shipping and solidly packaged. I just tested this 2 hp induction motor at no load and it worked well.